Nonbinary (often spelled Non-binary in British English) is an umbrella term covering any gender identity or expression that does not fit within the gender binary. The label may also be used by individuals wishing to identify as falling outside of the gender binary without being any more specific about the nature of their gender. As an umbrella term, nonbinary has similar scope to genderqueer with most nonbinary-identifying individuals also considering themselves genderqueer. However the terms have different meanings and connotations. The term genderqueer predates nonbinary by at least a decade. Kye Rowan designed the nonbinary flag in 2014, shown at right. This flag is meant to "represent nonbinary folk who did not feel that the genderqueer flag represented them. This flag was intended to go alongside Marilyn Roxie's genderqueer flag rather than replace it. The flag consists of four stripes. 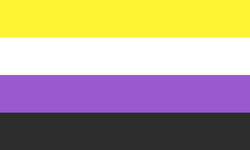 From top to bottom, they are yellow, white, purple, and black.. Yellow represents those whose gender exists outside of and without reference to the binary, as yellow is often used to distinguish something as its own. White represents those who have many or all genders, as white is the photological presence of color and/or light. The purple stripe represents those who feel their gender is between or a mix of female and male, as purple is the mix of traditional boy and girl colors. The purple could also be seen as representing the fluidity and uniqueness of nonbinary people. The final black stripe represents those who feel they are without gender, as black is the photological absence of color and/or light." The nonbinary flag and the genderqueer flag are both options for nonbinary people to use to symbolize themselves and take different approaches to how to symbolize nonbinary genders. Photograph taken during the Paris Gay Pride March in 2016. The banner is printed with the colors of the nonbinary flag. The big letters say "My gender is nonbinary," with dozens of names of specific nonbinary identities listed in smaller letters in the background. See main article at history of nonbinary gender. In 2014, Kye Rowan designed the nonbinary flag, shown at the top of this article. This flag is meant to "represent nonbinary folk who did not feel that the genderqueer flag represented them. This flag was intended to go alongside Marilyn Roxie's genderqueer flag rather than replace it. The flag consists of four stripes. From top to bottom: yellow represents those whose gender exists outside of and without reference to the binary as yellow is often used to distinguish something as its own. White represents those who have many or all genders as white is the photological presence of color and/or light. The purple stripe represents those who feel their gender is between or a mix of female and male as purple is the mix of traditional boy and girl colors. The purple also could be seen as representing the fluidity and uniqueness of nonbinary people. The final black stripe represents those who feel they are without gender, as black is the photological absence of color and/or light." The nonbinary flag and the genderqueer flag are both options for nonbinary people to use to symbolize themselves, and take different approaches to how to symbolize nonbinary genders. In 2014, "Nonbinary" was one of the 56 genders made available on Facebook. Agender aka Genderless, Non-gender - Having no gender identity or no gender to express (Similar and sometimes used interchangeably with Gender Neutral and/or Neutrois). Androgyne aka Androgynous gender - Identifying or presenting between the binary options of man and woman or masculine and feminine (Similar and sometimes used interchangeably with Intergender). Multigender (may also include Androgyne) - Moving between two or more different gender identities at different times/situations or having more than one gender identity at one time. Some multigender identities are bigender, polygender, and genderfluid. Gender Neutral aka Neutral Gender - Having a neutral gender identity and/or expression, or identifying with the preference for gender neutral language and pronouns. Genderqueer aka Gender Queer - Non-normative gender identity or expression. While genderqueer originated as an inclusive umbrella term, it is also considered by many to be an individual identity. Nonbinary or non-binary - Identifying with the umbrella term covering all people with gender outside of the binary, without defining oneself more specifically. Is also used as an individual identity in itself. One could be nonbinary butch or nonbinary femme. Transgender - Identifying with the umbrella term covering all gender identities or expressions that transgress or transcend (go beyond the limits of) society’s rules and concepts of gender (Transgender is a wide umbrella term also covering people who hold binary gender identities and expressions but who transgress gender by transitioning between the binary genders). You can read about many more of these at list of nonbinary identities. There is no single or 'correct' way to perform a nonbinary gender. Most nonbinary people are primarily motivated by the desire to be comfortable and true to themselves rather than attempting to follow any particular gender role. Nonbinary people may or may not experience gender dysphoria or may experience only bodily or social dysphoria. Nonbinary is a wide umbrella term covering a large number of gender identities and expressions. Whichever way any particular nonbinary person needs or chooses to present, express or perform their gender is as valid as any other. Not all nonbinary people experience gender dysphoria or follow the 'transition' narrative. Some feel that there is no social role or body to 'transition' to and so simply focus on being themselves. Some nonbinary people may choose or need to present an androgynous or gender neutral gender expression; perhaps choosing to hide, remove or blend gender cues. This is personal to each individual and is not any more nonbinary than any other way of expressing a nonbinary gender. Some nonbinary people experience bodily dysphoria relating to certain primary or secondary sexual characteristics. The act of obscuring, removing or replacing these sexual characteristics in order to reduce gender dysphoria may result in physical androgyny without the individual having set out to specifically obtain an androgynous presentation. Some nonbinary people may choose or need to present a 'clashing' combination of gender cues that are incongruous, challenging or shocking to those who expect others to fit the gender binary. For example, combining a beard with makeup and a padded bra. This practice of transgressively breaking the rules of gender presentation is known as genderfuck, genderfucking or sometimes genderpunk. Some nonbinary people prefer to be referred to using gender neutral language and pronouns. Some choose a gender neutral title such as Mx or Misc for formal communications. Others may opt for no title. Some nonbinary people prefer to expand on or subvert what is considered socially acceptable for their assigned gender. This may involve preferring binary pronouns while crossdressing, blending or mixing gender cues or otherwise subverting the expectations society places on that gender role. Some may consider this to be a political act, for others this is simply an expression of self identity or personality. Some nonbinary people have no preference for gender neutral language but instead have a preference against the language and pronouns associated with the gender they were assigned at birth.